The ability to adjust pressure in a damper will make it one of the more versatile tools in any heavy gauge stamping situation. Being able to change the tonnage in your press in just a few minutes saves on down time and tooling. It also allows the dampers to be used on a different size presses (smaller) if needed. This makes the dampers useful life much greater because it can be used across a number presses over time. 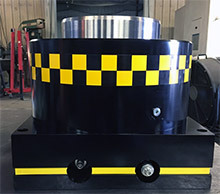 External pressure adjustment is a unique quality of W-Technologies damper and no other competitor in the market has this feature. To change the pressure in a W-Technologies Hydraulic Shock Damper all you’ll need is a hex head and pressure gauge. Then you’ll need to locate the flow control valve and use the wrench to adjust the pressure up (rotating in clockwise) or down (rotating it counter-clockwise). It’s really that simple. The dampers will optimize the performance of any press. It will also Increase production by running at a reduced pressure will allow the press to run at higher SPM without excessive wear. Contact us today to learn more about hydraulic shock dampers and how they can benefit your process today.